Virtually since television’s invention, artists have used its form, content, and media to create artworks whose intentions range from homage to critique. Your Content Will Return Shortly is a group exhibition that explores how contemporary artists harness the in-between moments of our television experiences. 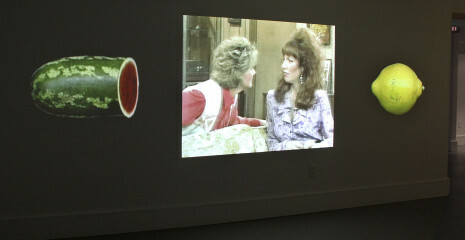 By taking their cues from the physical and functional qualities of television and a variety of elements associated with broadcasting, they touch on phenomena that include: advertising; laugh tracks; the effects of VHS, DVD, and remote control devices on viewing habits; public service announcements; and nuanced observations of the relationship between spectacle and cable news. The exhibition is on view from January 24 – March 24, 2013, at Franklin Street Works with a free public reception on Thursday, January 24, from 5:00 to 8:00 pm. Exhibiting artists include: Christopher DeLaurenti, Eric Gottesman, Jonathan Horowitz, Sophy Naess, Jeff Ostergren, Lucy Raven, Martha Rosler, Catherine Ross, Emily Roz, Carmelle Safdie, and Siebren Versteeg. As Raven’s text implies, Your Content Will Return Shortly looks beyond the screen and asks questions about the cultural circuitry surrounding television as well as its relationship to daily life and contemporary art. Using videos, photographs, Internet, and sculptural elements, the artists in Your Content Will Return Shortly provide insights into the structures and languages of television, reminding viewers that their relationships with the commerce, programming, and operational structures of TV are multifaceted and extend far beyond the living room.